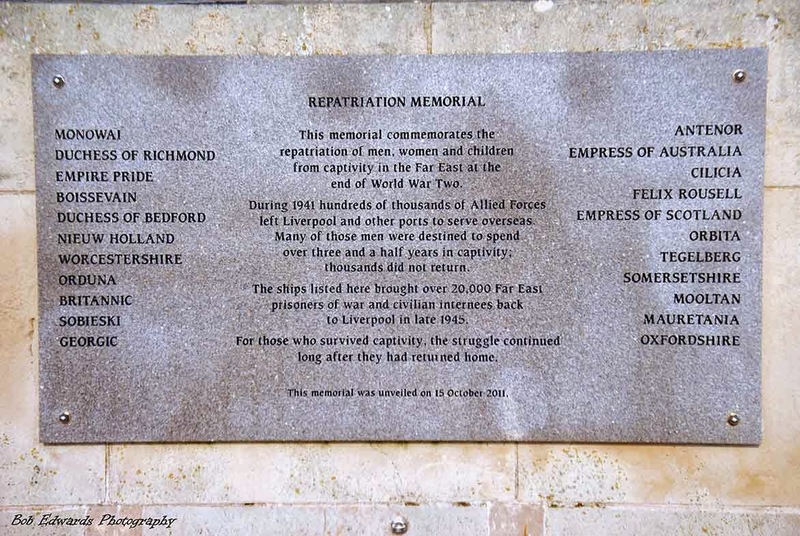 Next time you visit the Pier Head, take a look at the Repatriation Memorial. When members of the Researching Far East Prisoner of War History Group considered the best way to honour the Far East Prisoners of War (FEPOWs),the Pier Head seemed the obvious place at which to erect a lasting memorial. The Plaque was unveiled on 17 October 2011 by camp survivor Maurice Naylor CBE, 91, in front of 650 guests. He was captured in 1942 in Singapore and spent three and a half years as a Prisoner of War, toiling on the infamous Burma Railway, a project which claimed the lives of thousands. More than 50,000 British Forces capitulated to the Japanese between the fall of Hong Kong in December 1941 and March 1942 - when the vast territories of the Dutch East Indies surrendered, 2,000 civilians returned to Britain from captivity in South East Asia and the Far East at the end of World War Two. The photograph below shows repatriated prisoners of war disembarking from the Monowai, the first ship back to Liverpool on October 8, 1945.
the first ship back to Liverpool on October 8, 1945. More than 20,000 servicemen and over a thousand civilian internees - men, women and children - disembarked on the Pier Head at Liverpool in just eight weeks from October 8 to December 5, 1945. The majority were captured on February 15, 1942, when Singapore fell. These prisoners of war were used as a slave labour force by their captors and more than a quarter of them died due to untreated disease, neglect and brutality. While the war in Europe ended in May 1945 Japan’s military leaders refused to accept unconditional surrender, despite the fact that their countrymen and women along with several thousand Allied prisoners of war, were starving to death. 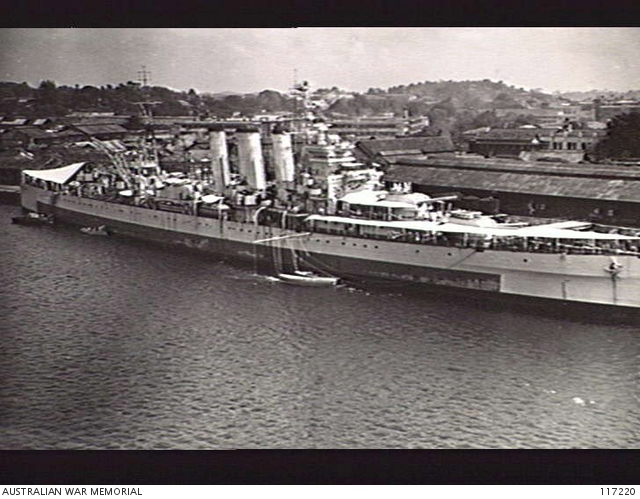 By the summer of 1945 a multinational Allied fleet of British, Australian, New Zealand and Canadian ships had joined the vast US Navy in the Pacific ready for the invasion of Japan. At the same time tens of thousands of British and colonial forces had gathered in India and Ceylon (now Sri Lanka) in preparation for “Operation Zipper”, the liberation of Malaya and Singapore. After final warnings of dire consequences the United States unleashed their new weapon, the atomic bomb, on Hiroshima on 6 August. Still the Japanese High Command refused to accept unconditional surrender. Three days later, on 9 August, the second atomic bomb fell on Nagasaki. Operation Zipper was a British plan to capture either Port Swettenham or Port Dickson, Malaya as staging areas for the recapture of Singapore. However, due to the end of the war in the Pacific, it was never fully executed. Operation Tiderace was next put into action soon after the Atomic bombings of Hiroshima and Nagasaki. 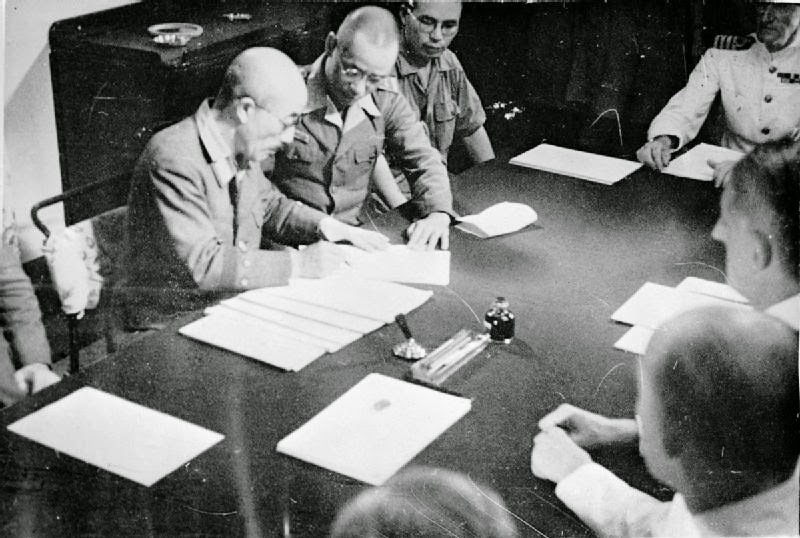 Emergency planning was put in preparation for the rapid occupation of Singapore at an early date should Japan agree to accept the terms of the Potsdam Declaration of 26 July. It was only when the Emperor intercede that the war in the Far East finaly came to to an end. The Allies had planned the repatriation of Far East Prisoners of War (FEPOWs) for some time and their response was swift and effective. Many of the camps were known about; others took weeks to locate and evacuate. Food and medical supplies were dropped and the massive invasion fleet was hurriedly transformed into a repatriation force. Aircraft carriers in the Pacific steamed for Australian ports to offload their redundant aircraft. Hangars were converted into vast temporary dormitories and wards for the thousands of sick prisoners. 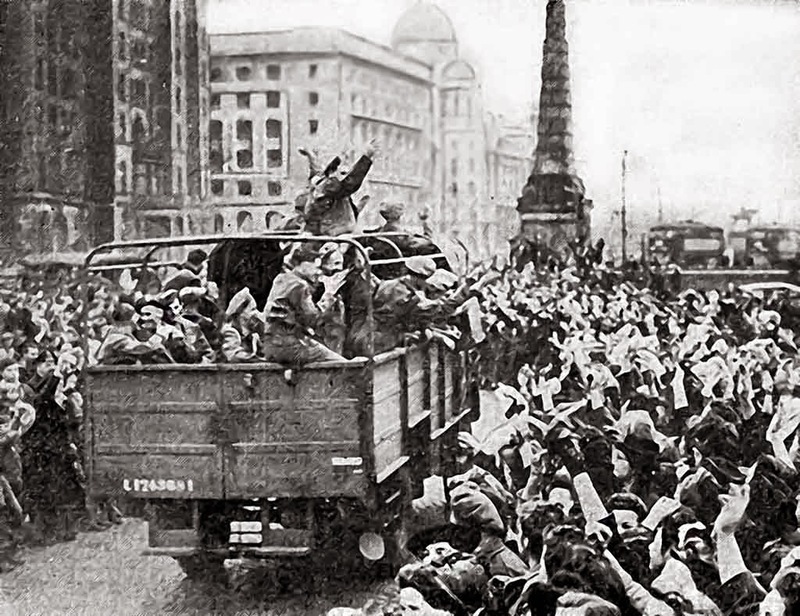 Within a week or so of the end of the war, most senior military prisoners of war had been liberated by the Russians from camps in Manchuria in North East Asia and were flown home. However, the vast majority of men, and almost all civilians, had to wait for several more weeks in their camps. British POWs liberated in the easternmost parts of the former Japanese empire, such as Hong Kong and Japan, eventually travelled back via the Pacific to the west coast of America, took trains across Canada and embarked for Britain from either Halifax, Nova Scotia or New York. Whichever route they took home, most benefited from up to six weeks at sea in which they could start to adapt to freedom and begin the task of healing shattered bodies and minds. 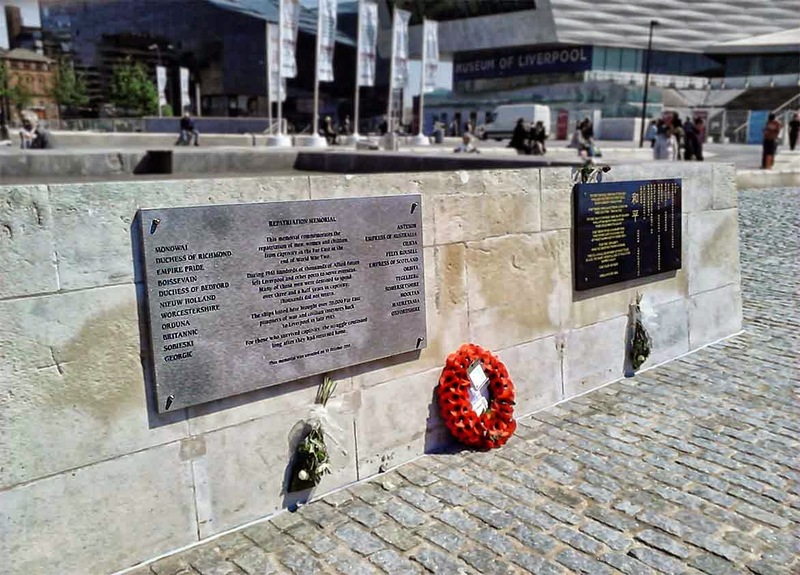 The repatriation memorial (below) is an engraved silver-grey granite stone plaque at the Pier Head is dedicated to the memory of those who survived. Many of the servicemen who ended up in camps in the Far East had left their home country from Liverpool in 1941 or even earlier. For so many of them their struggle to survive continued long after their return home.